Commercial-scale integrated crop-livestock systems intensify land use by combining complementary agricultural enterprises and leveraging synergistic ecosystem services to achieve both productive and environmental outcomes. Although widely implemented in southern Brazil as an annual beef/soybean rotation, tradeoffs such as competing soil water use between pasture and crop phases may result from seasonal grazing in this system. We compared soil water and plant physiological variables in the crop phase of an integrated annual beef-soybean system managed with no-till and best grazing practices with those of an ungrazed cover crop control as part of a long-term experiment in southern Brazil. A mixed black oat (Avena strigosa Schreb.) and Italian ryegrass (Lolium multiflorum Lam.) pasture was either grazed by beef cattle to 20-cm sward height or left as an ungrazed cover crop in the winter, and direct-planted to soybean (Glycine max [L.] Merr.) in the summer. Although soybean yields did not differ between grazed and ungrazed treatments, soil matric potential was on average 25% lower across depths and growth stages in plots that had been grazed during winter. Soybeans in grazed plots also exhibited up to 34% lower light-use efficiency and a 2-week slower time to physiological maturation than soybeans in plots that had not been previously grazed. These results describe for the first time the differential crop growing conditions and crop physiological responses created after 16 years of integration with grazing animals. As integrated crop-livestock systems grow in importance in commercial production settings, this research can inform adaptive management practices to ensure the sustainability of these systems into the future and under a variety of environmental conditions. 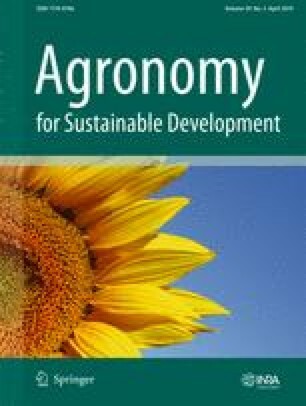 The authors thank M. Gilbert for helpful comments on a draft of the manuscript, the Garcia de Garcia family and farm staff at Agropecuária Cerro Coroado for their longstanding support of the São Miguel das Missões experimental station at Espinilho Farm, and Augusto Caetano, Gleice Menezes, Angel Zubieta, Natascha Grinnell, Rodrigo Michaovski, Vicente Padilha, Jonatas Silva, Gustavo Heissler, Júlio Azambuja, Naihana Schaffer, Débora Rubin, and Mateus Soldera for their invaluable assistance in the field and laboratory. This material is based upon work supported by the National Science Foundation Graduate Research Fellowship Program under Grant No. (1650042, P Mohapatra), an international travel allowance through the CAPES-NSF Graduate Research Opportunities Worldwide program to CP, and by the USDA National Institute of Food and Agriculture Agricultural Experiment Station Hatch Projects to AG (project CA-D-PLS-2332-352H).